Leslie Kendall, Dmitri Matheny, Ed Dunsavage, Joe Cohoon, Chicken Hirsh & Tony Hayes. SOLD OUT! Please email us at mail@siskiyoumusicproject.com to be on the wait list. 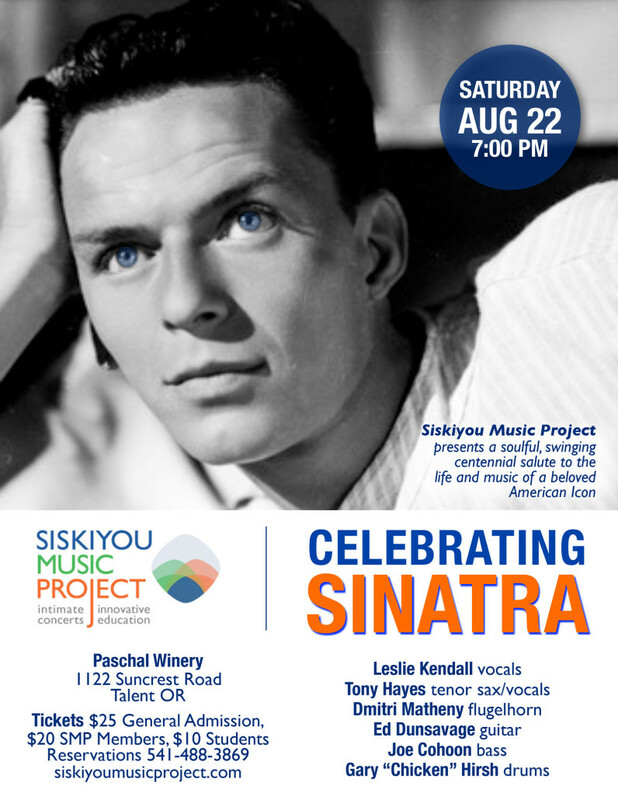 Siskiyou Music Project’s last show for the summer series is a very special salute to The Chairman of The Board, Frank Sinatra. Celebrating Sinatra in the centennial year of his birth, we will delve into the Sinatra Songbook from the first 2 decades. This special show features vocalist Leslie Kendall with the Ed Dunsavage Trio featuring Chicken Hirsh and Joe Cohoon and special guests Dmitri Matheny on flugelhorn and introducing Tony Hayes on tenor sax and vocals. The performance will include Sinatra favorites such as Come Fly With Me, In The Wee Small Hours of the Morning, One For My Baby and many others. Seating is limited and will sell out fast so reserve early!